Have you tried matcha green tea powder? This is my first time using it in a recipe and totally love it! This is now the best Vegan Pancake Recipe I have ever made! I topped with figs and blueberries mixed with agave. Can I just tell you that I am disappointed that it took me THIS long to start working with Matcha! I don’t know why I haven’t used it before! Even though I have had desserts made by other bloggers or in restaurants, I never really tried my hand at it! But, you have heard the platitude about better being late to Matcha than never trying it before! Now, that I have tried it, I can’t stop using it. I even flavored my sparkling water with it and it was the best drink ever made! So, what is matcha? Its tea leaves dried and turned into a powder. What’s the difference between Green Tea and Matcha Tea Powder? Basically, when tea is harvested, the components of the leaves are extracted and the remaining part of the leaf is discarded. That’s how we get regular green tea. To make matcha, the whole leaf is used to make the powder! This stuff is fascinating, isn’t it? As I was researching it, I came across so many fun facts and matcha health benefits. I am not a dietician or health professional of any kind. These 5 fun facts are my own opinions from what I researched. 4) True Matcha is Scarce! One of my many dreams, is to attend a very traditional Japanese tea ceremony. There are so many preparations that go into making the tea. There are precise steps taken during the preparation, requiring ritualistic steps. When you finally consume it, its almost a very zen moment! Have you heard of L-theanine? I hadn’t heard of it until now and it is a very intriguing amino acid! (I never thought I would ever say that about amino acid). It has this amazing ability to cross the blood-brain barrier and as a result, it can calm the mind. The body will feel relaxed and you will find yourself energized! 1 cup of brewed matcha tea has more antioxidants than 10 cups of green tea! Holy Antioxidants, Batman! Its measured by a method known as ORAC (Oxygen Radical Absorbance Capacity) used by USDA. After reading that Matcha is a great source of antioxidants, I have to remake my Antioxidant blast to include this powder! To keep the antioxidant power, its recommended that you don’t mix it with cow’s milk products. The premium grade is the most common type found around the world. I used it to make both my pancakes and my mineral water using this (affiliate link) TEAki Hut brand and it was delicious. It also has a very prominent green color and tastes amazing. Source: Matcha Maru and Business Insider. For all its wonderful benefits, all matcha grades have one drawback. Since matcha is grown and extracted in its entirety, it has a high amount of lead. Now, let me tell you about these vegan pancake recipe. 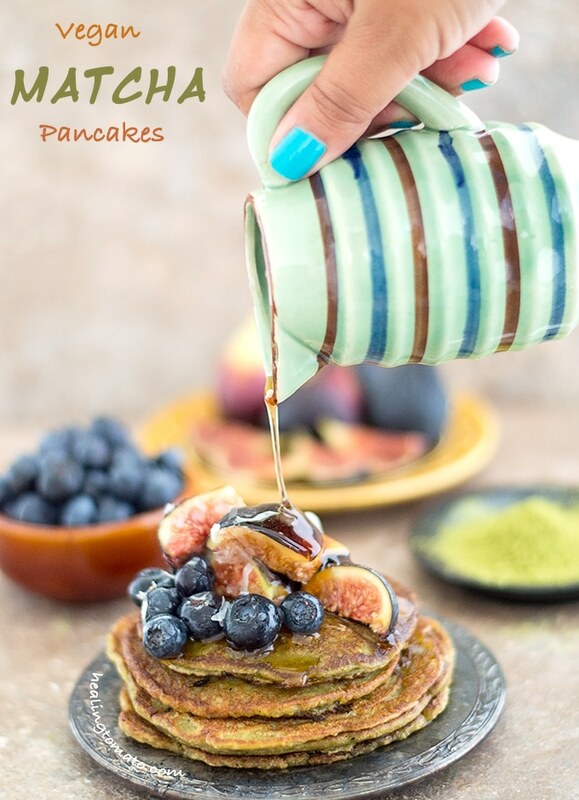 There is something so delectable about making pancakes from scratch, isn’t there? I feel like I can taste every ingredient in it and savor all the sweet ingredients. 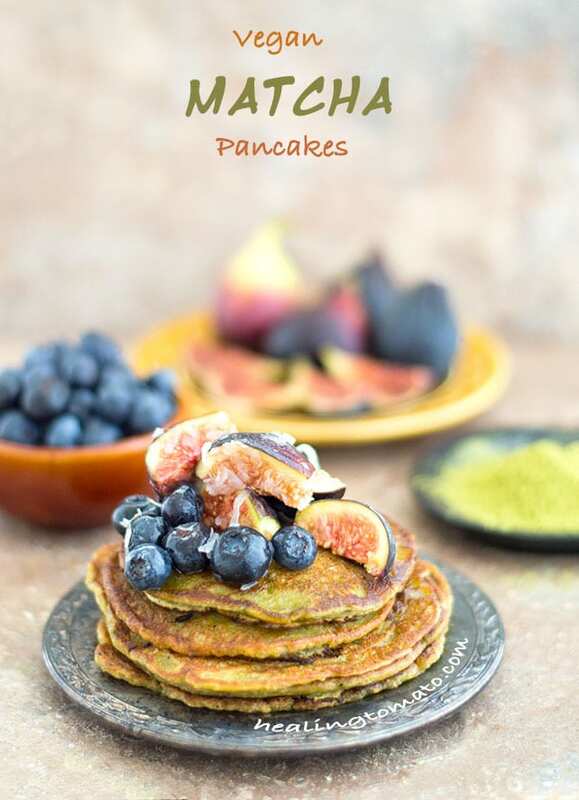 I wanted to make a very easy and quick vegan pancake recipe for Sunday brunch. This way, there is more time to devour it! Its going to be my Sunday brunch staple! 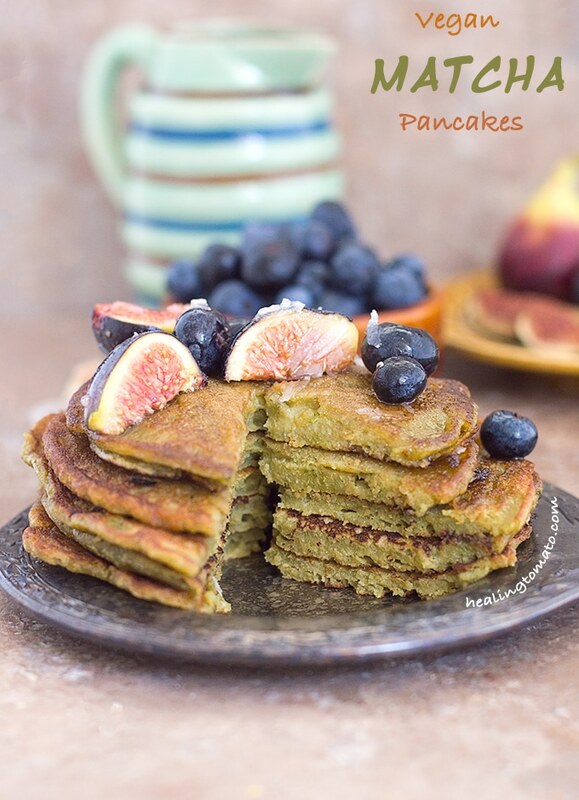 Try my vegan chocolate chip pancakes or my a savory scallion pancakes recipes. Tell me about your favorite Matcha recipe. 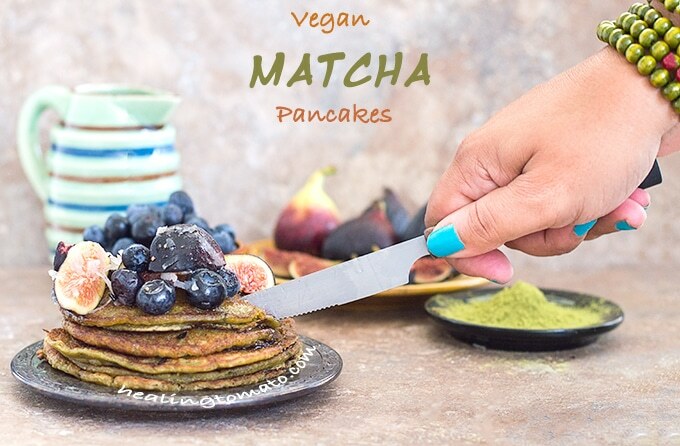 Vegan Pancake Recipe made with Matcha powder. Made in 20 minutes. I am a huge matcha addict. 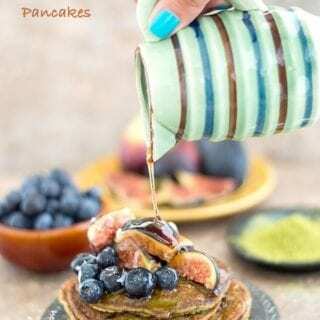 I haven’t tried it in pancakes, but it looks so good I know I will try this soon. Hoping gluten free flour will work as a substitute. Thank you, Sandi. I love all your Matcha recipes. Let me know how the Gluten Free Flour works out.